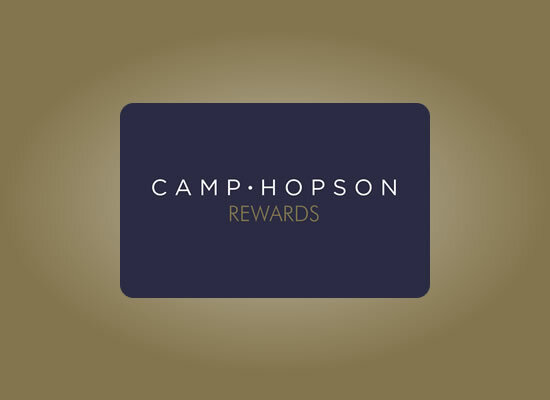 Using Camp Hopson Rewards is simple, the more you shop and use your card, the more points, promotions and exclusive offers you’ll receive. We need to take your postal address so we can send you your new Camp Hopson Rewards card, but we’d love to stay in touch with you via email and text message. This means we can keep you up to date with all of the great offers, exclusive events and fantastic promotions happening in store that we think you’ll love. In order for you to enjoy the full benefits of Camp Hopson Rewards we’d love to stay in touch and send you information on all the latest news, exclusive offers and events. We’ll always treat your personal details with the utmost care and will never sell them on to other companies for marketing purposes. To benefit from the full Camp Hopson Rewards experience please tick the boxes below to indicate how you would like us to stay in touch with you.